On this guided tour of the Baltics and Northern Europe, you’ll journey from Poland to Russia traveling through the Baltic States of Lithuania, Latvia, and Estonia, and Finland. Along the way, you’ll enjoy UNESCO World Heritage Sites, ancient cities, beautiful scenery, and fascinating historic sites-with overnights in Warsaw, St. Petersburg, and the capital cities of Vilnius, Riga, Tallinn, Helsinki, and Moscow. In each city, enjoy guided sightseeing of must-see attractions. In Warsaw, visit the 13th-century Stare Miasto (Old Town)-a UNESCO World Heritage Site – and the 14th-century St. John Cathedral, once the spot for weddings, coronations, and royal funerals. In Vilnius, visit the Old University, founded in 1569 by Jesuit monks, and the KGB Museum, situated in the former KGB building which tells about the occupation regimes that took over Lithuania from 1942-1990. In Riga, walk through the Art Nouveau Quarter and the Old Town – a UNESCO World Heritage Site – with a variety of architectural styles-romanticism, gothic, baroque, classicism, and modernism. Tallinn’s Old Town is a UNESCO World Heritage Site with watch towers, cobbled lanes, and medieval houses. Here, visit its Town Hall, built in 1402–1404, and the onion-domed Alexander Nevsky Cathedral – Estonia’s opulent Russian Orthodox cathedral. Helsinki’s sightseeing features a visit to the Lutheran Cathedral, completed in 1852, and Helsinki’s famous open-air market. Among the many sights you’ll see in St. Petersburg is the Hermitage Museum, with one of the world’s finest art collections. Travel by high-speed Sapsan train to Moscow, and visit the Red Square and the Kremlin, where you’ll see the treasures of the Armory Museum. All of this-and much more-await you on this fantastic escorted Baltics and Northern Europe tour. Day 9 Helsinki – St. Petersburg, Russia. Moscow – Capital of the Russian Federation. Founded in 1147, Russia’s largest and most modern city. The skyline of this exotic city will give you an idea of its rich and historic past. 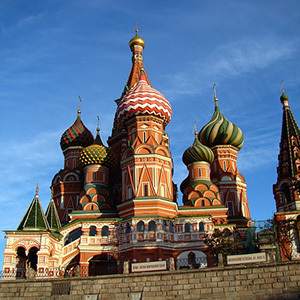 Many-hued, onion domed church steeples mingle with “multi-storied buildings,” which is what Moscovites call their skyscrapers. And at night, the many twinkling lights of the city are dominated by five ruby red stars atop the Kremlin’s towers. You’ll discover Moscow’s dazzling concentration of ornate buildings, museums, art galleries, and some of the world’s finest music, dance and drama.